Jim DiEugenio on Gary Mack's story of how he underwent his "conversion", and on several deceitful evidentiary assertions made for the Dallas Morning News. Many people expected that Gary Mack (real name Larry Dunkel) would begin to raise his profile as the 50th anniversary of President John Kennedy’s assassination began to approach. Well, no surprise, he has. 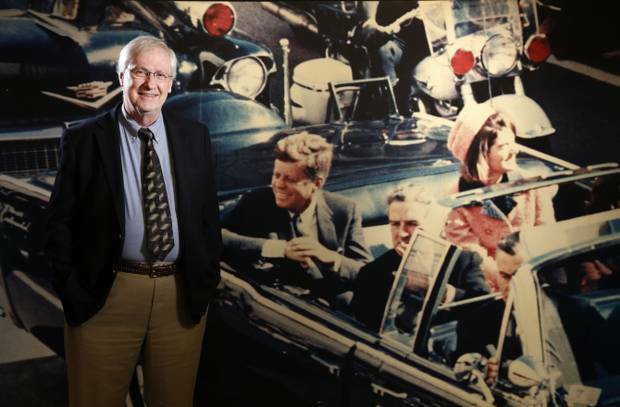 In two recent articles in the Dallas Morning News, Mack/Dunkel has again inserted himself both into the JFK assassination debate and the continuing struggle over who will be allowed in Dealey Plaza for the 50th anniversary this fall. Let us take up the latter issue first. On March 1st, the Dallas Morning News ran an article by staff writer David Flick. The article was headlined, “Blue Angels flyover at Dallas, JFK commemoration threatened by budget impasse”. The article began with the federal budget impasse and its possible impact on what Mayor Mike Rawlings and Ruth Altshuler have planned for their Dealey Plaza ceremony. The legendary Navy jet flying team the Blue Angels might not be able to perform because of the ongoing sequester process. Altshuler, appointed by Mayor Rawlings to head the committee running the event, presented this news to a local civic group at the Crescent Hotel. Gary Mack of The Sixth Floor Museum was also at the Crescent. Mack, who continues to go by his radio name even though he is not in radio for well over a decade, admitted that he had once been a critic of the Warren Commission. He also said that he still has questions about the murder although the case against Oswald was quite convincing. He then added what has become a continuing refrain of his, namely that there is not any hard evidence that the assassin was anyone but Oswald. To which one should add, if CE 399, the infamous "Magic Bullet", is not hard evidence Gary, then please tell us, what is? The reporter, Mr. Flick, apparently did not think it appropriate to ask Mr. Mack, “Well, if on November 22nd in Dealey Plaza is not the time and place, where is? Maybe Times Square in New York City on New Year’s Eve?” Clearly, the three-headed hydra—the Sixth Floor Museum, Belo Corporation, Rawlings’ administration—that set up this whole cordoning off of the Plaza at the appointed hour is feeling the heat of both the local and national exposure of their ill-conceived scheme. For instance, the Wall Street Journal ran an article on the controversy (Wall Street Journal, December 25, 2012) where Rawlings said he would be glad to meet with members of the critical community. (He later did so, meeting with Jefferson Morley and John Judge). But according to our sources, there has not been any movement off the main issue: the failure to grant access to the Plaza for any other group for that day. Therefore, leaving the critical community no choice, legal remedies are being prepared for if they are necessary. So, in addition to the bad publicity already accumulated, more may be on the way as a result of court proceedings. 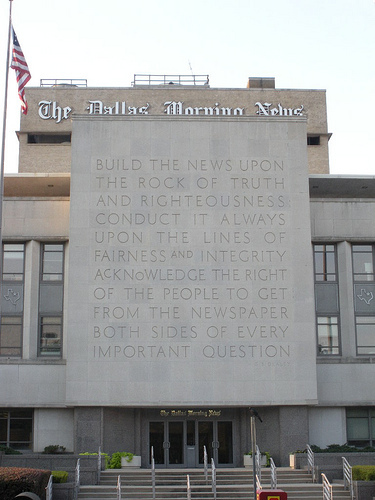 (Dallas Morning News, December 7, 2012). If there is a lawsuit enacted, one of the most interesting things to be found out in the discovery process is this: Who’s idea was it to file for a week long permit in order to preempt anyone else from getting one? According to information we have, this petition was originally submitted by the Sixth Floor. Who, I should add, Robert Groden thinks is also behind his continual ticketing and arrests in Dealey Plaza for selling literature critical of the Warren Commission's findings. As Dallas reporter Jim Schutze has noted, Groden’s civil suit against the city is ongoing for City Hall has not been able to make any trespassing charge against Groden stick. Groden has since filed a counterclaim for harassment charges. (Dallas Observer, February 25, 2013). Somehow Mack, Altshuler and the Morning News could not see fit to address any of these important issues at the panel meeting at the Crescent Hotel. Since they deal with the fundamental issues of freedom of speech and assembly, that is quite puzzling. What makes it moreso is that it now appears that the Rawlings/Altshuler strategy of preemption is not coming off as cleanly as expected. But, in one sense, this March 1st article was really just a warm up for Mack/Dunkel. Because the next day he was the exclusive focus of another article in the Morning News. Written by another staff writer, Michael Young, the banner on this piece was, “Gary Mack and the evolution of a JFK conspiracy Theorist”. In this story, Mack tried to address exactly what caused him to turn from being a strong critic of the Warren Commission’s verdict to actually supporting that verdict. To understand this paradox, one must be informed about Mack’s history in the critical community. For a long time, in fact, well over a decade, Mack/Dunkel was part of the Dallas based critical community. For example, he wrote articles for publication in journals like Penn Jones’ The Continuing Inquiry. He met at research meetings in the area that were instituted by Mary Ferrell. When the House Select Committee on Assassinations was convened he helped surface the Dallas Police radio dictabelt recorded on the Dealey Plaza route of the motorcade on November 22nd. This recording was the basis for the acoustical testing which led to the government's House Select Committee on Assassinations finding of at least four shots fired in the plaza, and therefore, a crossfire and conspiracy. In the eighties, along with Bob Groden, he was a main commentator on British documentary director Nigel Turner’s first installment of The Men Who Killed Kennedy documentary series. Today, of course, he has pretty much reversed field. Not only does he work for a museum that completely enshrines the Warren Commission, he has, by far, the highest profile of any person at The Sixth Floor. No one, repeat: NO ONE at that venue appears on TV, quoted in the media, or hosts as many cable TV specials on the case as Mack/Dunkel. And when he so appears he almost always states that the Warren Commission somehow got it right. In fact, Mack has hosted two of the very worst specials in TV history dealing with the Kennedy case. (Which, considering that history, is really saying something.) Specifically those would be, Inside the Target Car, and The Ruby Connection. (For just how bad those shows were, click here and here) One only has to consider the following about both presentations: Although the first show dealt with the issue of blood spatter pattern in and on the limousine, neither Sherry Fiester, a legal expert and recent author on that forensic issue, nor Pamela M. Brown, an authority on the limousine itself, were on the program. In the show on Ruby, not one authority or biographer of Ruby appeared e.g. author David Scheim. This is how much of a Baryshnikov pirouette Mack/Dunkel has performed. Not only does he now advocate—through specious methods—the now unsupportable conclusions of the Commission; he goes beyond that. He will not allow any other viewpoint to oppose him on the air or at The Sixth Floor Museum. Since, as any visitor can see, there are no books critical of the government's findings on the assassintion on sale there. One will not see, for example, recent works by authors like Warren Commission expert Gerald McKnight or Jim Douglass on the bookstore shelves. To me there seems to be a couple of problems with Mack's claim. First, the Roscoe White fairy tale does not—at all— impact on the evidence in the Kennedy case. That evidence is the same as when Mack/Dunkel appeared on The Men Who Killed Kennedy. In fact, there is even more evidence of conspiracy today since the JFK Act of 1992's Assassination Records Review Board declassified 2 million pages of documents related to Kennedy’s assassination thereby doubling the previous page count. Much of that evidence vitiates the Warren Commission even further. What those 2 million pages have to do with Ricky White is rather elusive, but since the Sixth Floor avoids it all, perhaps it’s not all that elusive for the simple matter that they don’t want to deal with it. Therefore, they censor this newly declassified evidence from their shelves. The second problem with this rather superfluous Roscoe White excuse is the timing of it. After the horrendous Inside the Target Car special appeared, I did an article on Gary Mack to try and explain this very question: What motivated his reversal? (Click here for that article.) From the interviews and research that I did, Gary Mack began to migrate to the other side before the exposures of the Roscoe White affair were fully aired. In fact, according to my sources, Mack’s transformation began with a notable event: his growing friendship with Dave Perry. Perry moved to the Dallas/Fort Worth area in the eighties. Through his former friend, the infamous Gus Russo, he tried to ingratiate himself with the local Kennedy research community. The problem was that few bought into the all too slick Perry as a Warren Commission critic. But one of the few who did was Gary Mack. In fact, they became fast friends. Some would say they were bonded at the hip. This friendship predated the Roscoe White affair. And, in fact, the two reportedly worked on that case together. To some of the people I talked to, it was this friendship that was central to Mack’s transformation. In fact, to one source, Perry admitted that he was Mack’s “handler”, and helped get him his job at the Museum. What makes this association even more curious is that once Perry moved into town, he also became fast friends with the CIA and FBI associated media asset Hugh Aynesworth. When "lone-nut" author Gerald Posner visited Dallas to research his now discredited book Case Closed, he reportedly stayed with Perry. Mack, Aynesworth and Perry clearly did not like my article. Because, first, it concentrates on this issue of the friendship and influence of Perry on Mack. Secondly, because it shows the very important relationship between Perry and Aynesworth. Today, Aynesworth is so well documented as being a government asset on this case that it’s embarrassing. Well, to everyone except Perry, Mack and the Dallas Morning News. That Perry developed this close alliance and friendship with the exposed cover up artist Aynesworth says all we need to know about him. Predictably, the article ends with a real schoolboy howler which is par for the course with Mack. If one recalls, in Inside the Target Car, Mack attempted to argue that no shot came from the front of the limousine, since if that were so, Jackie Kennedy would have also been injured. In looking at stills from the Zapruder film, it's obvious that Jackie was not in the line of fire. Robert Groden was in Dealey Plaza the day of the Target Car filming and told the producer that the actors playing President and Mrs. Kennedy were seated incorrectly. But yet, on the first telecasts of the show, Mack actually broadcast this canard, that Mrs. Kennedy would be shot, which he later retracted. Well, here we go again. Near the end of this article Mack claims that when Oswald woke up on November 22nd, he left behind on the dresser bureau, money, “his wedding ring and written instructions on what to do if he was arrested . . . . When a man does that, he’s made a major life changing decision. He’s decided to do something drastic and dramatic.” Except, Oswald didn’t leave any written instructions that morning for his wife to find. According to the Warren Commission, this alleged note was left behind back in April, 1963—seven months previously. It was after the assassination when Ruth Paine, the owner of the house where Marina Oswald had been staying (and where the Oswald possessions were stored), told the police to give Marina Oswald two books left at the Paine home. Ruth claimed Marina needed them since she used them every day. Tucked in one of the books was this note— supposedly written by Oswald though his latent fingerprints were not on it. Even more curious, the FBI took “seven latent fingerprints off the note; yet none of them matched Lee or Marina.” (James DiEugenio, Destiny Betrayed, Second Edition, p. 201) This was just part of the near endless stream of dubious evidence that Ruth Paine produced in the wake of the assassination. Mack made his argument for Oswald's "life changing decision" by including evidence that didn't exist that day. One wonders: do they have fact checkers at the Morning News? If so, how could a whopper like that escape them? Or maybe its just part of their mutual attempt to rewrite history.